After recovering from a sickness that would bring him to the edge of despair, Eric Gladen began researching the science behind what had made him so sick. His research led him straight into one of the biggest medical debates of all time, the question of whether or not childhood vaccines are causing Autism. He would end up quitting his career, moving into an RV, and traveling the country interviewing experts and piecing together thousands of studies and leaked documents. But Eric wasn’t focused on the vaccines themselves, he was focused on something that belongs nowhere near vaccines- mercury. From the Mad Hatter Syndrome in the late 1800’s, to Pink Disease in the first half of the 20th to the Iraqi Grain Incident in the early 1970’s, humans have learned time and again of the debilitating neurological and physical damage that mercury can cause. Then why and how did it end up in our childhood vaccines? Trace Amounts explores the origin of the use of mercury in the vaccines and exposes the continued greed based decision to keep mercury in the vaccines through several decades. Trace Amounts is the result of nearly a decade of research and travel, in which top scientists, government officials, parents of children with Autism, and the average Joe unravel the truths, secrets, and tragedies, of the skyrocketing Autism rates. Could a tragedy, which brought one of the greatest nations to its knees and stole a generation of children, have been avoided? Watch Trace Amounts and you decide. 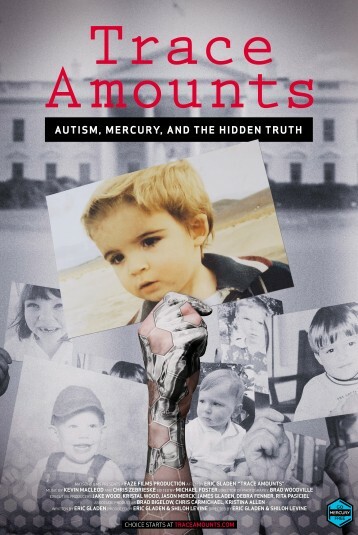 Trace Amounts movie-goers will receive a free ebook copy of Robert Kennedy Jr's book "Thimerosal: Let the Science Speak" on the dangers of mercury poisoning.